El República del Ecuador – a Spanish speaking country in northwestern South America that has a great deal of nature to offer: the Andes Mountains, the Amazon Jungle, the Atlantic Coast and certainly the world-famous Galapagos Islands. The country is home to such a great variety of species, that it is considered to be one of the most bio-diverse countries in the world. Needless to say, a perfect destination for us! We flew from Peru into the beautiful capital of Ecuador; a city situated in a picturesque valley with surrounding, towering mountains. Last year, National Geographic voted Quito (declared a Unesco World Heritage Site in 1978 because of its largest, least-altered and best preserved historic centre), as one of the top 20 destinations in the world to be visited. 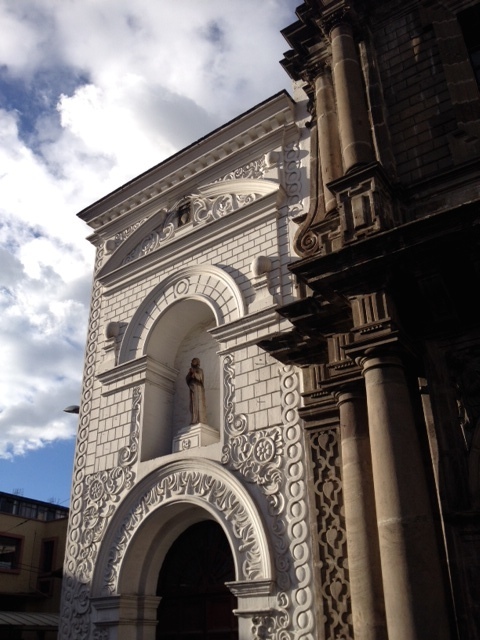 However, exploring this photogenic town with its 17th century churches and mansions, was not in the cards for us. Our 9 days in the city can be summed up with one word: CHICKENPOX. A little disappointed that we had to skip our week in Banos; the adventure capital of Ecuador (rock-climbing, zip-lining and hot springs. 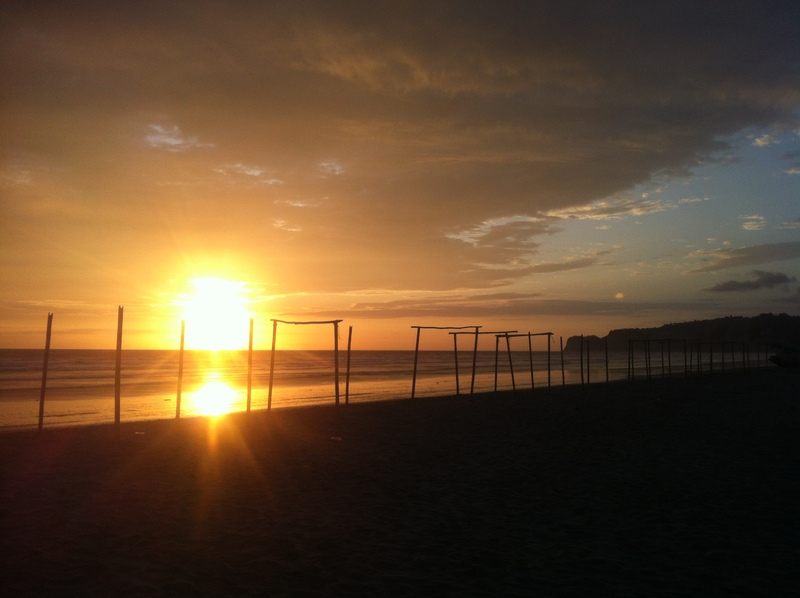 were out), but with natural immunity for life in our back pockets, we were off to sunny Canoa – a small beach town on the west coast of Ecuador. We were pleased that the roads leading to this small community were surprisingly good, and that our hotel for the next month was indeed the beautiful beach property it promised to be. 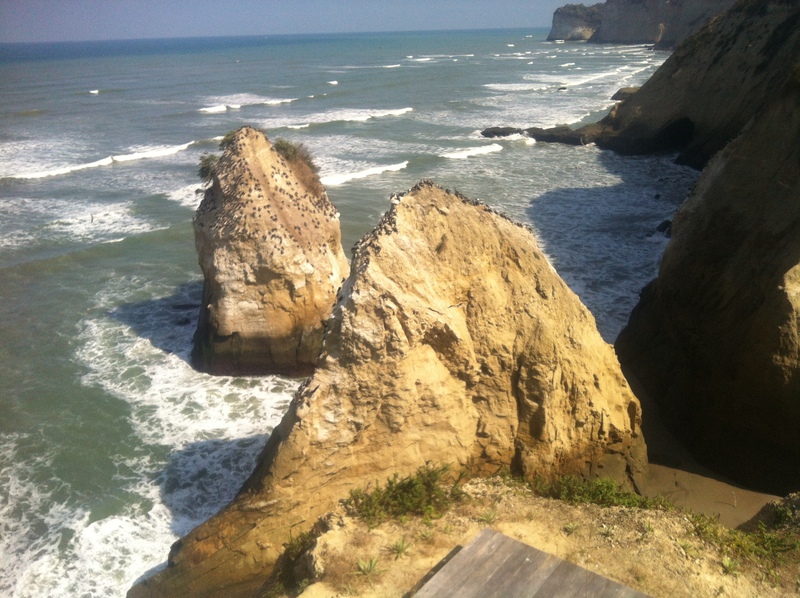 Instantly, we marveled at the under-developed nature of this beach area (some investment opportunities perhaps?). 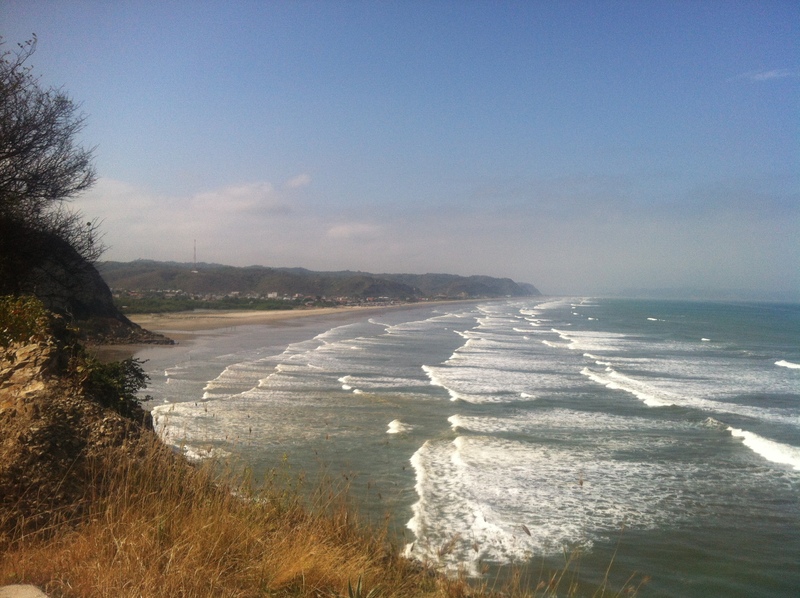 We were but a 15-minute beach stroll from Canoa town, and encountered only a few properties along the way. Long stretches of pristine beach with few people on it, surrounded us both left and right….And of course, the stunning, rolling waves and sunny skies threw out their welcome mats. 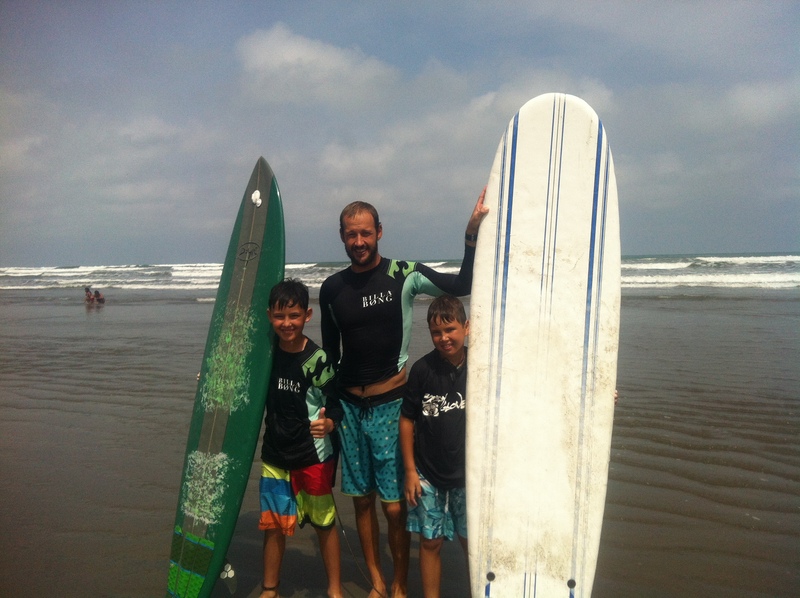 Canoa is a popular hang out place for surfers due to its consistent surf and so we quickly turned Emile and Filou into little surf dudes… signing them up for surf lessons (thanks YiaYia!). 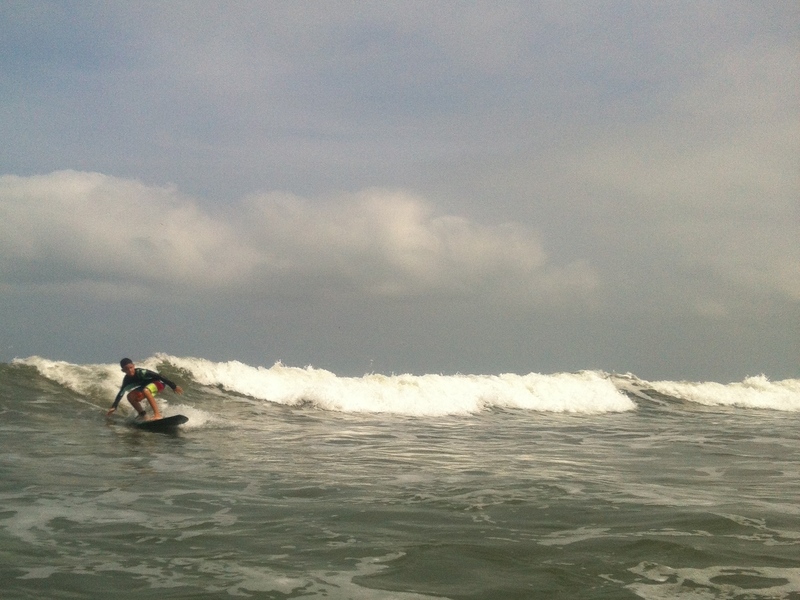 Guided by surf teacher Walker, the kids quickly found their groove and were up on their boards. They couldn’t get enough of it, and especially liked for us to film their progress – Anthony was eager to oblige with his new Go-Pro camera and I happily jumped some huge waves as not to get my Iphone wet, while taking action shots! While the kids conquered the ocean, Anthony and I took 10 classes of beach Yoga with Leanne Holder, a wonderful US expat (https://www.facebook.com/CocoCottages). Downward dogs and balancing tree poses (“be any tree you want to be”) are quite hard when you are starting out, but having your feet solidly planted into beach sand certainly makes it a little easier (and the “whatever you have available” line of encouragement helped a lot too)! Guided by Leanne’s wide range of yoga moves and soothing voice (which was amplified by the wonderful sounds of crashing waves in the background), we learned to find some inner peace, balance and ability to stretch. I think Anthony and I are both hooked now and just need to create a big sandpit in a yoga studio in Bangkok somewhere! Thanks Leanne for the fabulous t-shirt…the saying on it says it all! “Explore your Bliss – Ecuador”. Perfect trip t-shirt! As equally nice as Leanne was, were her mom Cynthia and her partner Ron – who regularly joined us in yoga. 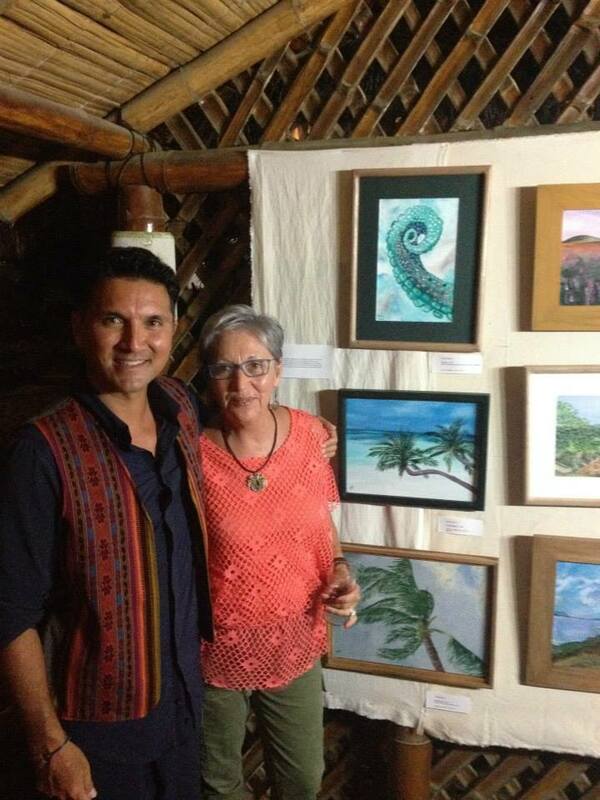 We had the pleasure of attending Cynthia’s local art show that displayed many beautiful acrylics and watercolours (was thinking of you mom!). Inspiration is probably not hard to find in this town as it is surrounded by magnificent nature – and Cynthia’s leaf and flower scenes were full of lovely detail and vibrant colours. One day, Cynthia, Ron and Leanne took the kids to the local caves where our fearless yoga instructor saved Filou from what she described as a “near-death experience” when he was taken by some huge waves that would have smashed him into the rocks had she not scooped him up quickly. Good thing, too, because he’s kinda precious to us! Of course, to this day he himself is absolutely oblivious about this incident – and describes his day with them as “the very best day in Canoa”. These wonderful 3 people also invited us for a bonfire to celebrate my 45th birthday! Great memories; connecting with new friends, lovely music, hot-dogs and jumping contests with Annie – an energetic and fun 30-yr old, who has her eyes set on Emile in 10 years. She named herself the kids’ “teacher of fun”, a role that described her joyful nature perfectly! And talking about joyful….when picturing high altitudes this is NOT a word that comes to mind for me. Not even close…I’m DEATHLY afraid of heights; don’t do anything at high altitude! 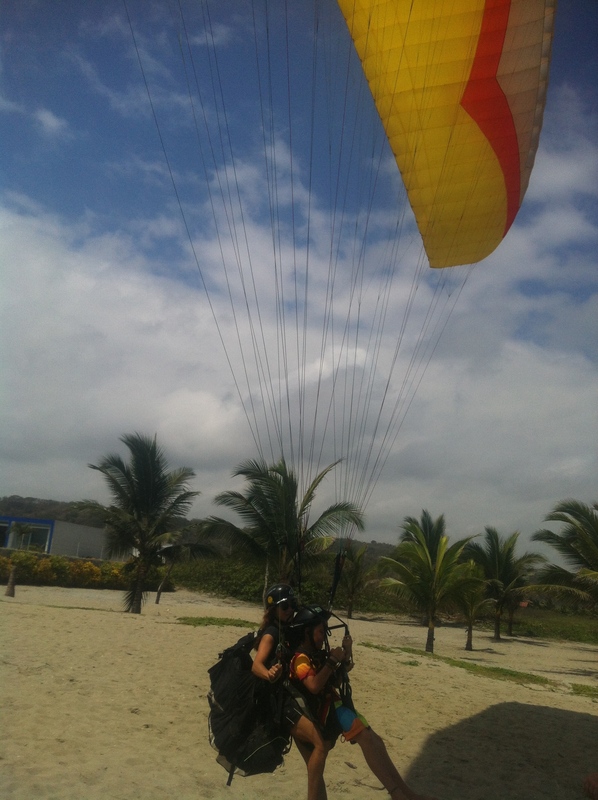 But Canoa is a key destination for paragliding and the boys had been eyeing the colourful parachutes in the sky. 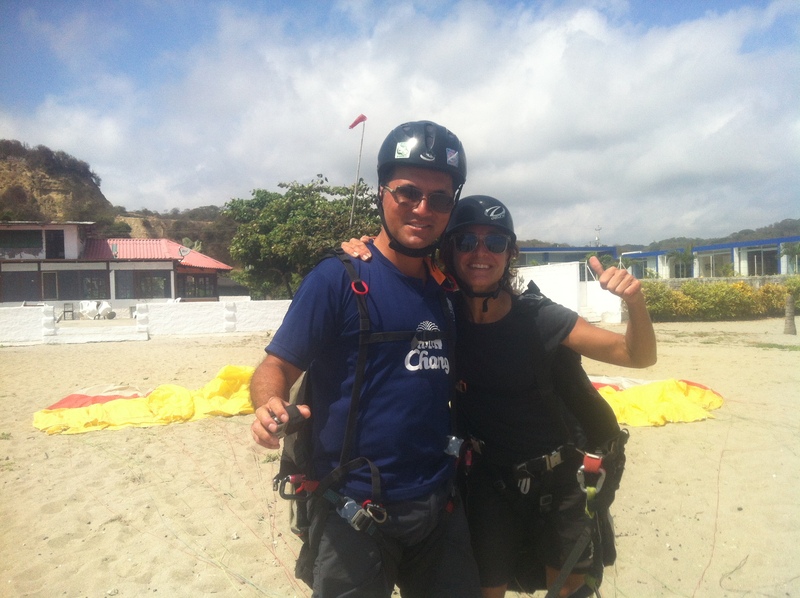 Could I overcome my fear and let Emile and Filou do something cool that they would remember for years? There was only one way for our family to find out; locate the safest operation in town! This part was easy: everyone knows in Canoa that you have to be with Alicia Harmon of Alas Y Olas (http://www.alasyolasecuador.com). She is a strong, little dynamo who is all about safety and creating the right conditions for an enjoyable flight (we know, as it took us a couple of times of checking out wind conditions before we actually took of). 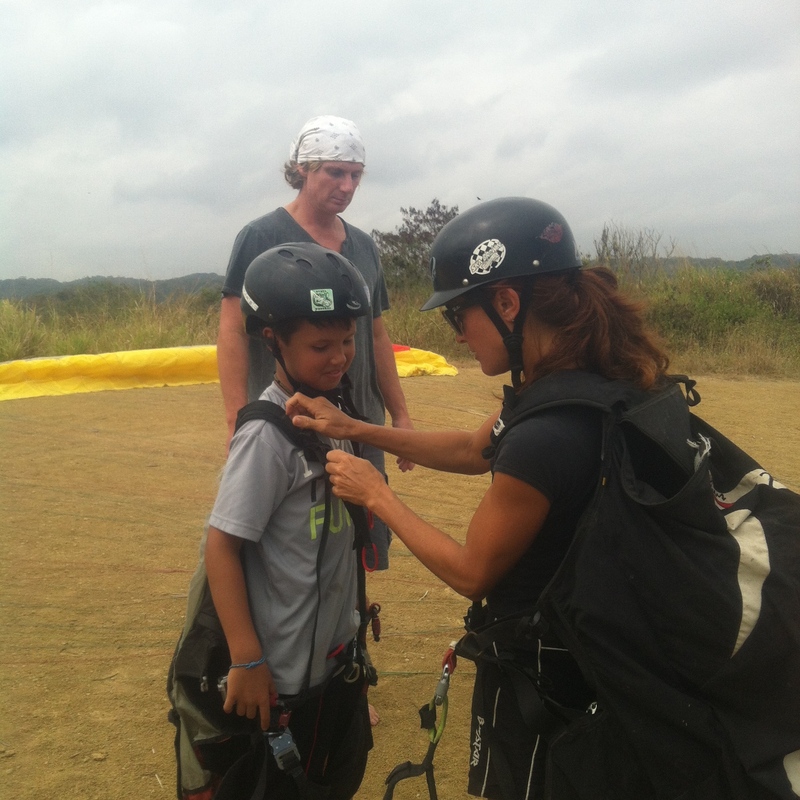 When the day was finally there, we got our instructions and were buckled into a tandem harness (Watanabe family member in front, Alicia behind)… and were suspended below a lightweight, large wing – looking like a long rectangular parachute; we used a nice bright yellow one. Filou was giving it a try first, with Emile and Anthony shortly following him. They all had a lovely flight (no fear whatsoever) and were making their excitement known from high in the sky…. It was terrifying enough seeing the kids and Anthony held up in the sky by some ropes and fabric, but now it was my turn. Was I really going to risk my life and run off a 200-metre cliff into the abyss? For some reason, at that moment I was really compelled to do it (although with racing heart and very shaky legs)…and there I jumped and flew like a bird. It was AMAZING; so much more peaceful then I imagined it to me. And of course, the views were magnificent! The reason for doing this became quickly clear to me – of course, it was important to overcome one of my own fears but more importantly it was a lesson for the boys that if you put your mind to things, you can grow and overcome. 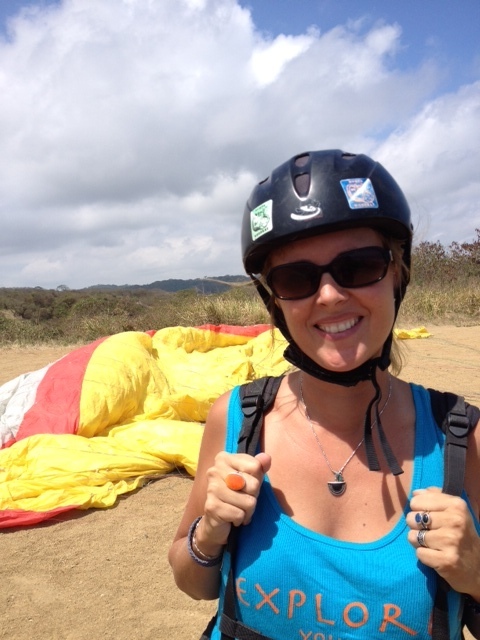 In Paris, I had been too afraid to climb the Eiffel Tower as it was so high, and now I was paragliding – a sport many people would never dream of doing. I think I made a little progress – thank you World Tour (and Alicia and Bret for your help)! And so Canoa will be remembered for many great things: adventure sports (and yoga), World Cup Soccer & the wonderful beach community. We cheered along with our new Ecuadorian, US and Swiss friends – but mostly we were there in orange to scream for our Dutchies. There were the easy wins: 5-1 against Spain (Holland certainly had something to prove after last World Cup’s defeat against them…and they brought it big time), and then there were the nail-biter games such as 2-1 against Mexico (where the Dutch scored two goals in the last 10 minutes). It was almost more fun to watch Emile than the screen, as he was so into each and every game. What a soccer fan; he knew all the stats, teams and especially the strategies for the Dutch….and that for only a half-Dutchie (mom trained him well!). While we sat by ourselves dressed in orange for the first game, the fifth time around, we had all of our friends “converted”, and sporting beautiful naranja. What a great group of assistant fans like Gerry and fellow supporters! HUP HOLLAND! As we are nearing the end of our world tour, it is certainly wonderful to receive, many lovely comments in regards to our boys. Many of the people in Canoa were sharing with us that they are inspired by what we have done this past year: travelling, learning and sharing as a family. And as nice as it is to get this kind of feedback – we are equally inspired by the travellers and expats that we’ve met around the world – such as some of the couples in Canoa. For example, Ron told Cynthia: “I’m going to sail around the world, are you in?” It didn’t take long for Cynthia to leave her corner office and quit her very successful job to literally sail away with Ron. That first trip lasted 3.5 years. Ever since then, the two of them have been co-pilots, travelling to and living in many places. 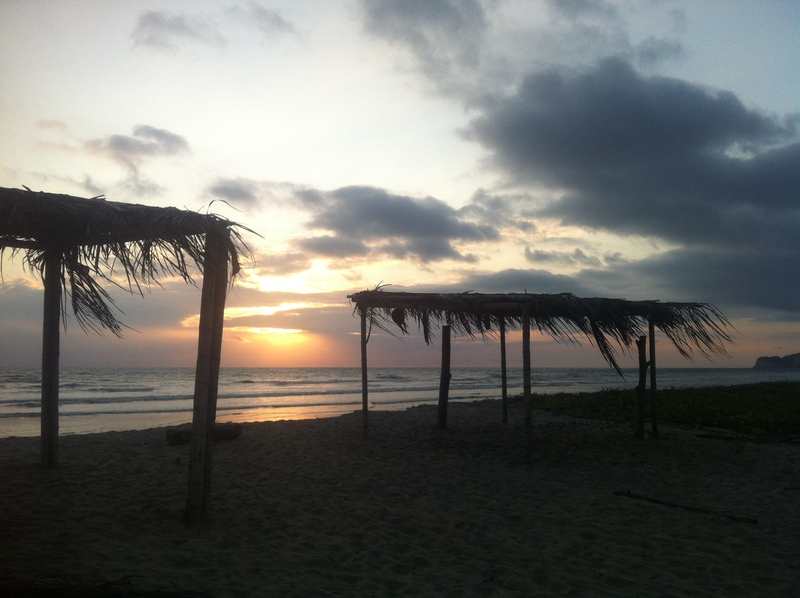 They are now settled in an idyllic beach-front property in Canoa. 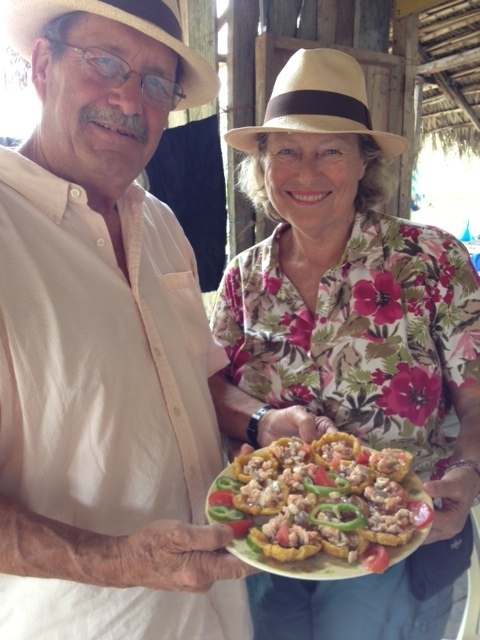 Cynthia paints, Ron does boogie boarding and together they are enjoying life- what a lovely couple! And then there was Gerry and Ursula – a dynamic expat couple from the US who were well connected to a host of locals. They travelled the world, partly working for the Peace Corps and had the best travel stories ever (you could just listen to them for hours!). Gerry, a successful, semi-retired businessman, had a dream of buying cattle in Ecuador. 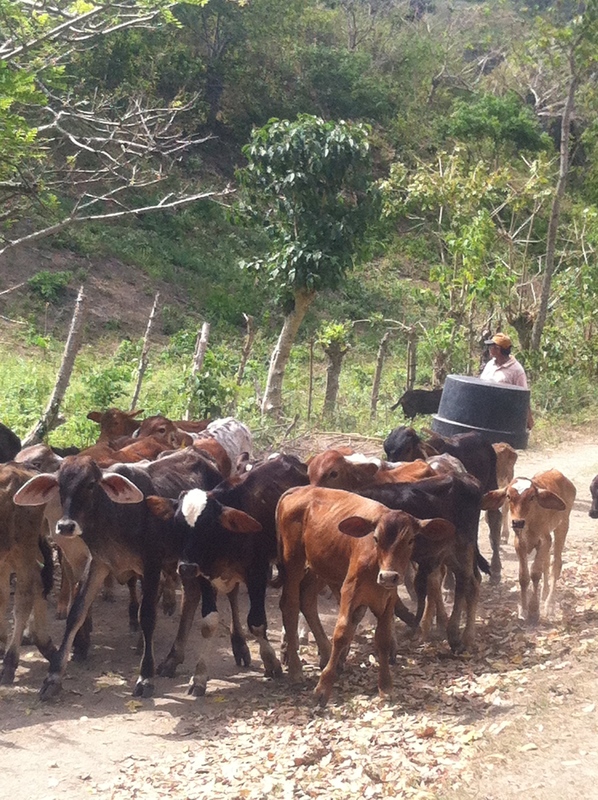 And so the couple settled in Canoa, had bought 60+ cattle and were working with great enthusiasm – and a local partner – to bring their vision to life. It’s called Hacienda Rio Canoa. We had the pleasure of visiting their ranch in Gerry’s new, “photogenic” truck). We love meeting people like this who have an incredible outlook on life, and in return, life has treated them well. They are following their dreams and sharing a bit of the journey with us along the way. 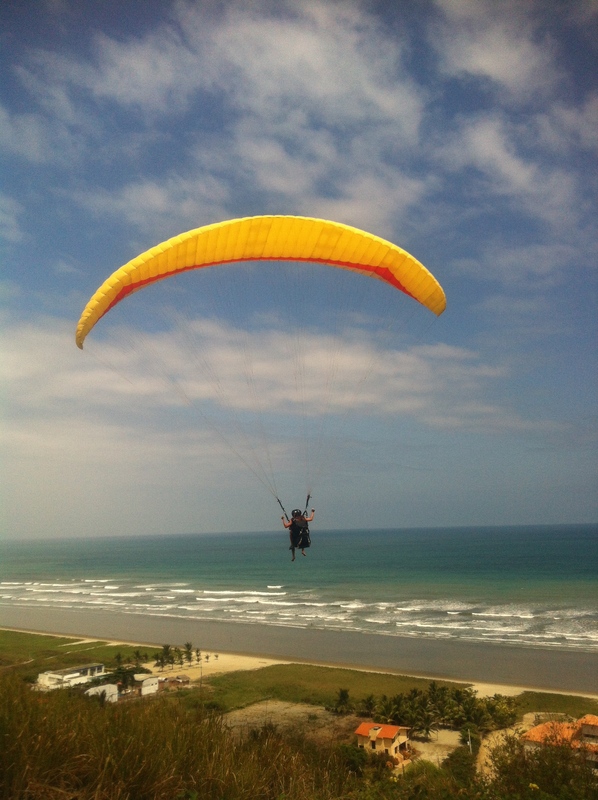 And Canoa was chock full of people like this, both long-term residents and passersby. Inspirational people; Gerry and Ursula. In their early 70s, he still calls her “cutie” and they laugh together all the time! We are in all in agreement that our time in this laid-back Ecuadorian town is going to be on the top of our list of enjoyable travel spots. Main reasons: the incredible community, the beautiful, pristine beach offering a host of activities and of course, the wonderful seafood! (Check out Korayma and find Charlie on the beach for some great local dishes such as my personal favorite: Pescado Encocada – fish in a light coconut curry sauce). Thank you Don – for all your wonderful tips on the town and surrounding areas. You are an ambassador for Canoa and we are grateful…and Gerry, Ursula, Cynthia, Ron, Leanne, Annie, Tom, Willemijn, Alicia, Brian, Josh, Patience and Michael. We appreciated our connection with each of you and you all made for a very fun stay! And so after a last cook-out (American version of a potluck!) and a delightful Canoa sunset, we moved onto Guayaquil. 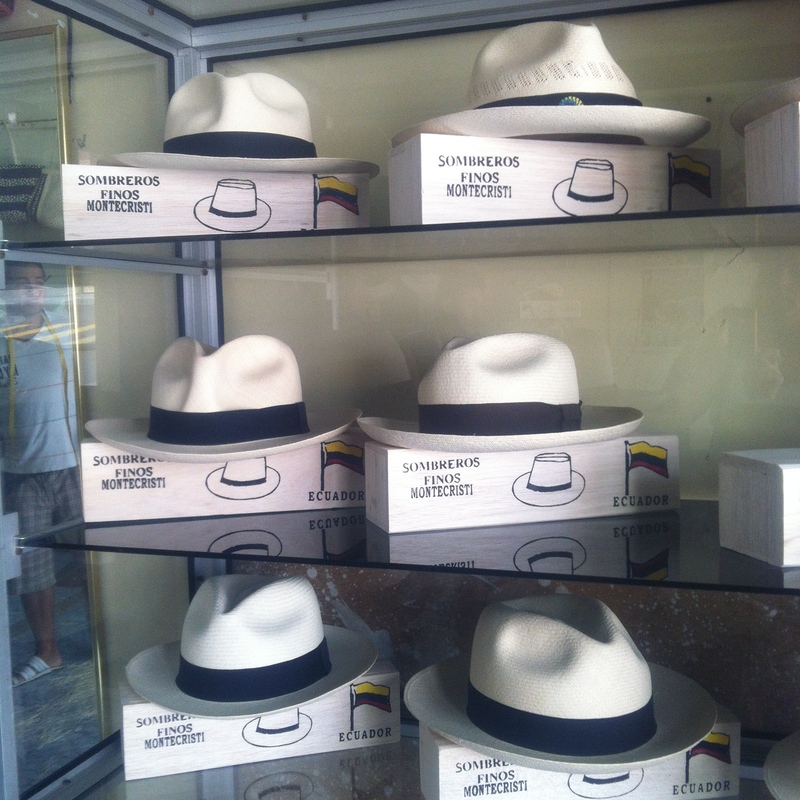 We left Canoa, took a taxi to Manta and then a bus to Guayaquil – but with an important stop in Montecristi; the town known for the production of the finest straw hat in the world, the Panama Hat. Yes. That’s right, those cool hats do not come from Panama City; they come from Montecristi, Ecuador. The hats are made from Toquilla straw, hand-split into strands not much thicker than thread and woven so finely, that the Montecristi Panama Hat appears to be made from linen. Depending on quality, one cost anywhere from $20.00 to over $25,000!! (the best and superfine ones are called Montecristis). 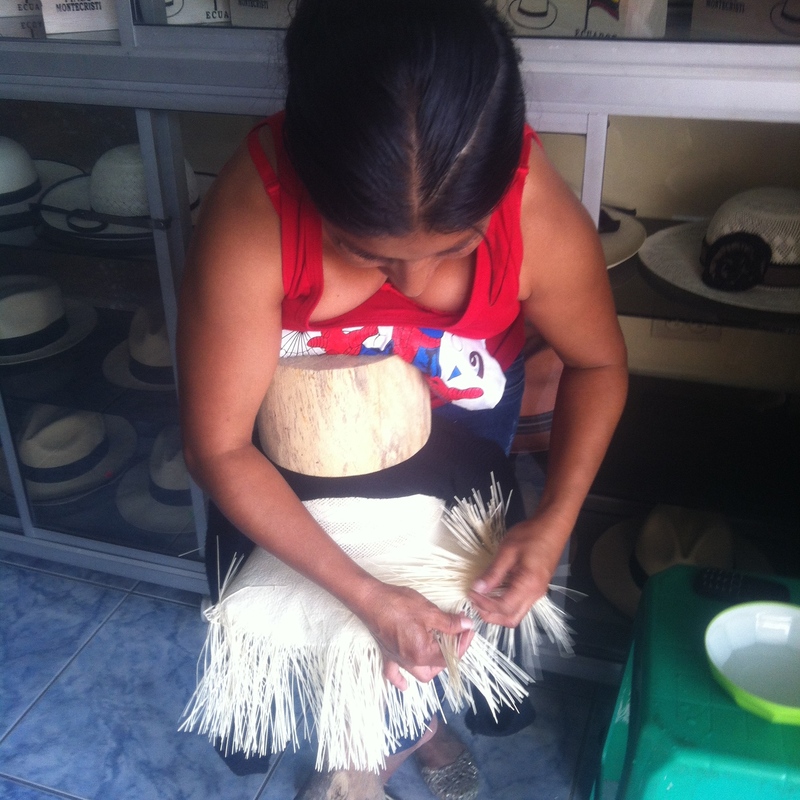 And although the Panama Hat continues to provide a livelihood for thousands of Ecuadorians, fewer than a dozen weavers are capable of making these finest “Montecristi superfinos”. So we were excited to visit a small shop and workshop place (www.montecristifactoryhats.com) where two young guys had lots of hat samples on display. In the shop, a lady was demonstrating the weaving process; she was leaning over a block of wood while carefully moving superfine strands of straw over one another. The art of weaving these traditional Ecuadorian Toquilla or Panama Hats is so unique that the process was added to the UNESCO Intangible Cultural List in 2012. It was really cool, we got to see this up close…and of course indulge in buying an example as a great memory and stylish fashion accessory! With our new Panama Hats – pretty cool eh? And after a restful night and a great swim at the Nucapacha Hostel (http://www.nucapacha.com) in Guayaquil, we were ready for our final stop. Really hard to believe, but we are off to our LAST travel destination. 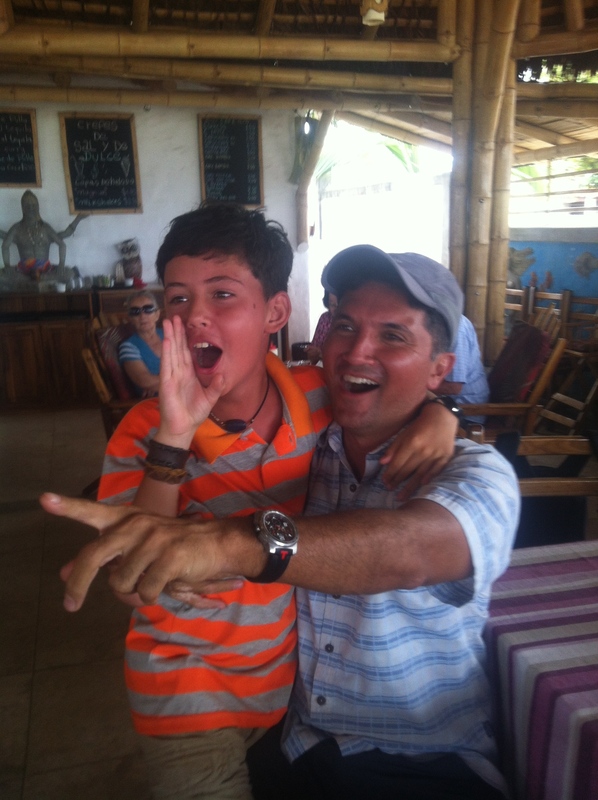 Galapagos Islands, here we come….